Click here to see sea otters LIVE!!!! This is the story of Shelly the sea otter. She lives in the Pacific Ocean off the shores of southern California. 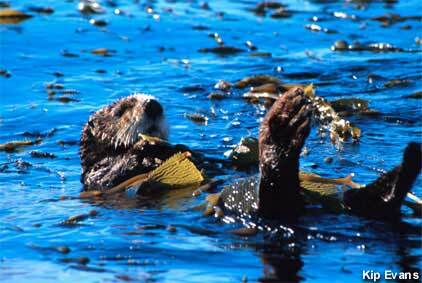 Right now she's basking in the sun, holding herself in place by wrapping the kelp around her body. She has many sea otter friends that live in the area today, but they face many hazards because of humans. What might those hazards be? Sea otters were on the brink of extinction just 40 years ago, with only 38 remaining in California. Today there are many more...how? How many? Will it last or will Shelly and her friends still be in danger of not passing on life?